Everything you needed to know about buying and using motorhomes in the UK and overseas. 1) I would like to hire or try before you buy a motorhome, can you help? 2) I am considering buying a motorhome, but have never driven one before. What is your advice to beginners? Book a session on our motorhome manoeuvring course – these courses are ideal for beginners. It’s a one-day course and includes a one-to-one session on the road, driver exercises with instructor feedback, defensive driving and various manoeuvring exercises. 3) What type of motorhome should I buy? There are many different types of motorhome on the market, so it’s wise to do your research before you buy. A motorhome is either adapted from a series-production panel van or car (conversion), or is designed and built on a commercial chassis, with or without a production driving cab (coachbuilt or A-class). The accommodation section is usually fixed but on a few models can be dismountable. 4) Do I need a special driving licence? In general, the answer is no. Most drivers can drive a motorhome of up to 7500kg, or 8250kg including a trailer. However, a limit of 3500kg applies to drivers aged over 70, or a driver licensed since 1 January 1997, unless a medical test or additional test respectively is passed. 5) How easy are motorhomes to drive? Most are quite straightforward although often somewhat different to a car. Manoeuvring in tight situations can be a problem due to large overhangs on some models. However, practice and/or aids such as reversing cameras will help increase confidence. 6) What’s the best advice for keeping motorhome tyres in good condition? Preferably replace any tyre more than five years old, but never exceed seven. They will have significantly deteriorated by then, whatever the tread depth or amount of use. If the motorhome is not used for a considerable length of time, it is recommended that the wheels and tyres are removed and stored at normal inflation pressure in a cool, dry place and protected from direct sunlight, sources of heat, ozone concentrations and fuel/oil spillages. They can be covered with a natural material (e.g. hessian not plastic) for protection. Failing this, make sure the vehicle is moved from time to time, to ensure that one point on the tyres isn't loaded all the time. 7) Are there any special requirements when choosing a pitch? 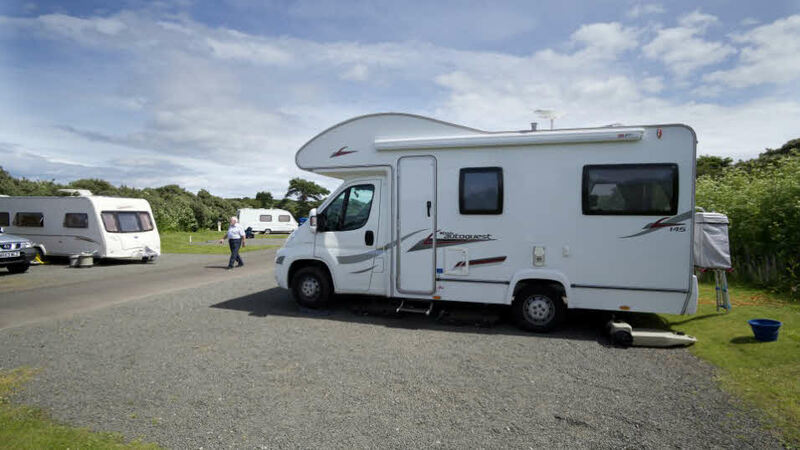 Hardstanding pitches are more suitable for motorhomes, but if using grass then check the ground before you drive on to it, by digging in your heel. Be aware that some sites may have temporary or permanent restrictions on motorhomes, so it is best to check when you book that they will allow your vehicle on site. We do not set limits for length or weight of vehicle, but practicalities mean that not all pitches on all sites will be suitable for all vehicles in all weathers. 8) Can I tow a small car behind my motorhome? In the UK, although the law is a somewhat grey area on this, it is acceptable to tow a car not weighing more than 750kg gross vehicle weight, which includes the weight of an unbraked A-frame. As far as the Continent is concerned, however, the majority of countries say that members of the public caught towing with an A-frame would be taken off the road. Therefore, in all circumstances we recommend that vehicles are towed on a braked trailer which takes all four wheels of the car off the ground. 9) What is the difference between butane and propane? Butane and propane have slightly different properties, the most important to the motorhomer being the boiling point at atmospheric pressure. In other words, the temperature at which it changes from being a liquid to being a gas. Butane will only readily change to a gas above 0C, so is generally suitable for the spring to autumn motor caravanner. Propane will become a gas down to -40C and therefore can be used in winter, or all year round if desired. In the UK propane is generally sold in red or green cylinders, butane in blue. 10) What precautions should I take against the risk of fire? Install a smoke detector made to the appropriate British Standard (BS 5446 pt 1). A portable fire extinguisher should also be carried. We recommend that Aqueous Film Forming Foam (AFFF) is the most effective for use on a caravan site. Take extra care when cooking or smoking in the vehicle. 11) Why do I need a leisure battery as well as a car battery in my motorhome? An automotive battery is designed to supply a high current for a short time in order to start the engine. For the remaining time it is either at rest or being charged by the vehicle alternator. It is not designed to supply a few Amperes over several hours, which is the kind of output the habitation area of a motorhome requires. Leisure batteries are designed to supply currents of a few Amps for longer periods and to be discharged and recharged many times; they are generally to be preferred in a motorhome. Battery life is enhanced if it has little work to do, so the use of a suitable charger is advisable if a mains hook-up is available. Most motorhomes are fitted with both types of battery, and the addition of a leisure battery to serve the habitation area of one that isn't so fitted, is often a worthwhile upgrade. 12) How can I run my refrigerator on ferry journeys? The short answer is you can’t! For short crossings of an hour or two, the contents should remain adequately cool until you are able to re-connect, provided the refrigerator was pre-cooled sufficiently beforehand. For longer journeys it is best to purchase fresh produce on arrival at your holiday destination. You can help the fridge stay cool by using ice packs, as used for cool boxes, and of course do not open it while the power is off. 13) What does The Club recommend for winter storage? An indoor and preferably secure location is recommended for winter storage. Turbo diesels are liable to waste gate corrosion over long periods of non usage. Brake disc corrosion is also a possibility where the motor caravan is not being used over a long period. There are covers which can be purchased from car manufacturers to fit over the discs while the van is in storage to stop moisture coming into contact with the discs. 14) Do motorhomes require seat belts for their rear seats? Seat belts must be fitted and worn in the front seats of motorhomes. Most motorhome manufacturers also fit restraints to forward-facing seats – designated travelling seats – in the rear. If fitted, seat belts to these seats must be worn. Seat belts fitted to seats that are not properly designated passenger seats (eg sideways facing seats) do not meet the necessary standards, and the anchorages would not be adequate. These seats should not be used at all for travelling purposes. However, it should be stressed that, although not illegal, travelling in these seats is not recommended. From May 2008 all child restraints must comply with the UN ECE 44.03 standard (or subsequent versions). Children under three years must use the child restraint (i.e. child seat or booster) appropriate for their weight in any vehicle (including vans and other goods vehicles). A child under three may travel unrestrained in the rear of a taxi if the right child restraint is not available. In vehicles where seat belts are fitted, children three years to 135cm in height (approx 4ft 5in) MUST use the appropriate child restraint. In a taxi, if the right child restraint is not available. For an occasional journey over a short distance, if the right child restraint is not available. The Government defines this kind of journey as being for unforeseen circumstances only, not for regular or planned journeys such as the school run. Where two occupied child seats in the rear prevent the fitment of a third child seat. 15) Where is the safest place to store my motorhome, and what security devices are available to protect it from theft? Nowhere is safe from a determined thief. The majority of motorhomes are stolen from storage compounds, closely followed by the home address. Thefts occur all year round with newer motorhomes most vulnerable. To avoid becoming another insurance statistic, and to meet most insurers’ acceptance conditions, certain precautions should be taken. Many security devices are available, from immobilising devices (petrol vans) and cut off devices (diesel vans) to pedal covers, detachable steering wheels and devices that lock the vehicle in reverse, as well as alarms, tracking devices and wheel clamps. We suggest choosing products tested and approved by a reputable independent test agency, e.g. Sold Secure or Thatcham. 16) Will my television function abroad? As in the UK, TV in much of Europe has converted to digital. The UK’s transmission technology is one of the more advanced in Europe, meaning that digital televisions intended only for use in the UK might not be able to receive terrestrial signals in some other countries. A multi-standard TV (which most sold for motorhoming use are) will help, but in some countries a satellite system may be preferable, especially if you wish to receive English-language broadcasts. 17) What is the best type of aerial for my motorhome? As a general rule a directional aerial is preferable to an omni-directional, and in the past was often the only way to receive analogue signals in many areas of weak transmission. 18) Do I have to have a type-approved towing bracket for my motorhome? If your motorhome is type-approved, then any towing bracket fitted to it must also be type-approved. If it is not type-approved, any towing bracket fitted doesn’t have to be type-approved (although there’s no problem if it is). 19) How do I know what appliances I can use on a mains hook-up? A useful calculation is amps equals watts divided by volts. Therefore, if you have a 1000-watt kettle, and a 230-volt supply, you must allow for 4.3 amps to be drawn when the kettle is in use. 20) Does it matter what type of chemical fluid I use in my portable toilet? Our policy is that all chemical fluids should be bio-degradable to assist the biological treatment of sewage. Blue fluids on the market may contain formaldehyde, dependent upon the manufacturer. Green fluids are all formaldehyde-free but may not be so efficient at breaking down sewage waste in holding tanks. Both green and blue fluids are acceptable for use on Club sites and with the correct dilution should not affect any sewage treatment method.